Seduction of the Innocent is Better With Monkeys. 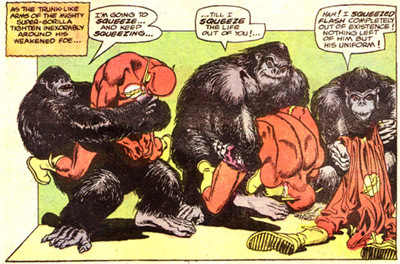 Not sure which is worse, that Grodd appears to be forcibly sodomizing the Flash, or that he seems to believe that it’s possible to squeeze something out of existence. Given the Power of Elephantiasis by a Radioactive Filarial Worm. Jimmy Olsen: Recipient of the World’s Worst Swirly. New 52 Wonder Woman, Same as the Old 52 Wonder Woman. Mostly.